This flatware designed by Zaha Hadid gives new life to the term “mindful eating.” While the pieces of this place setting are immediately recognizable as forks, spoons, and a knife, each stainless-steel utensil looks as if it is reflected in a fun house mirror. The pieces are very individualized, but as a five-piece group they work together harmoniously and seem to belong together. This set asks its user to accept these small sculptural objects as tools, and in doing so, to rethink the movements of eating that are usually done on autopilot. Zaha Hadid, who died just a few months ago, was an internationally acclaimed architect and design celebrity. Her complex and geometric architectural projects adorn skylines across the globe. Though perhaps an unexpected project from an architect, this flatware actually shares many design ideals with Hadid’s award-winning buildings. Her work emphasizes continuous, fluid motion; the unique curves seen in her design for the Heydar Aliyev Cultural Center in Baku, Azerbaijan, are not a far cry from those of this spoon that could sit on your dining table. While it is a little surprising to see this invocation of movement in items that are usually strictly functional, Hadid carries it off with her trademark grace. Her flatware fits cohesively with the environment in which it was first displayed, an exhibition entitled Zaha Hadid: Form in Motion, at the Philadelphia Museum of Art. This exhibition included furniture and small-scale objects that Hadid designed for the home. Though these pieces look like they could be from the future, they insist on existing in our current world. This makes them endlessly beautiful and fascinating. 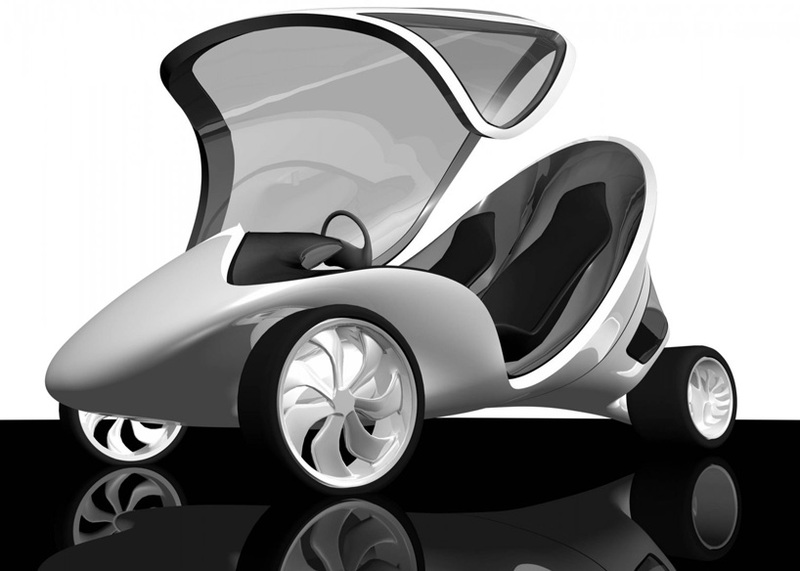 Along with the flatware and other items, Hadid exhibited a design for a three-wheeled aerodynamic car prototype called Z-Car I. 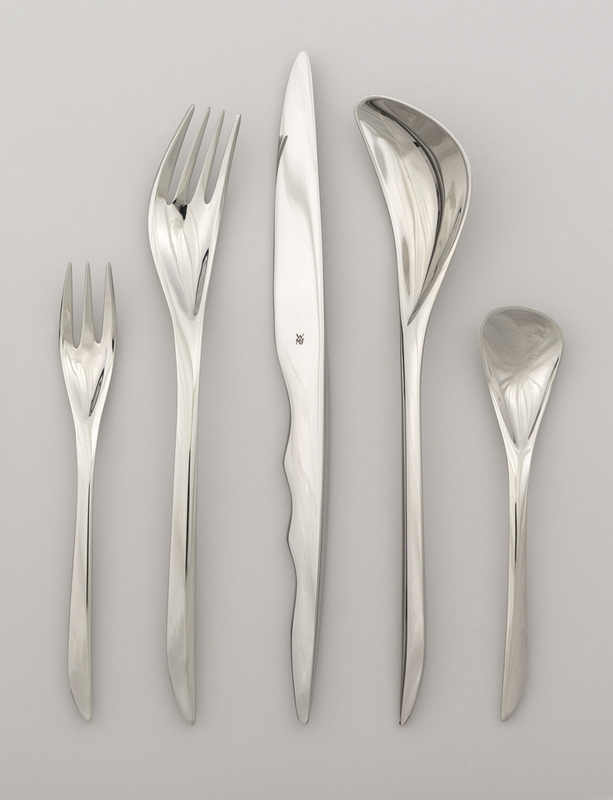 In fact, the accelerating curves on the pieces of her flatware set nod to car design. The juxtaposition of the Z-Car I and the Zaha place setting in the same exhibition allows the brilliance of Hadid’s formal visual language to shine. A press release for the Philadelphia Museum of Art expressed this too, and wrote that Hadid’s “exhibition design emphasizes… how the fields of architecture, urbanism, and design are closely interrelated in her practice.”[i] Hadid’s place setting is a small-scale model of how she achieves this synthesis. This is not to say that using the Zaha flatware makes for easy dining. Although the description of the set on the Zaha Hadid Designs website says that “each piece is ergonomically balanced and a pleasure to use,”[ii] Craig Kellogg wrote in a New York Times review that “Zaha Hadid doesn’t slave for ergonomics… The flatware set certainly makes eating a conscious act.”[iii] Hadid strove for her work to charge, shape, and define the space around it. If the user of a fork inhabits the space around a fork, perhaps it is intentional that an unexpected design should jolt one out of any banalities of eating. Hadid was born in Baghdad, Iraq in 1950 and worked relentlessly throughout her life to realize her design goals. In 2004, Hadid was the first woman to receive the Pritzker Prize, the equivalent of the Nobel Peace Prize in the architecture world. She was the recipient of the 2010 Stirling Prize from the Royal Institute of British Architects, the 2009 “Praemium Imperiale” from the Japan Art Association, and was ranked at the top of the “Thinkers” category in TIME Magazine’s 2014 list of “The 100 Most Influential People in the World.” In early 2016, Hadid passed away, and the world lost an inspiring mind and role model. This humble example of Hadid’s work speaks to the ubiquity of her design in a modern world that ceaselessly approaches the future. 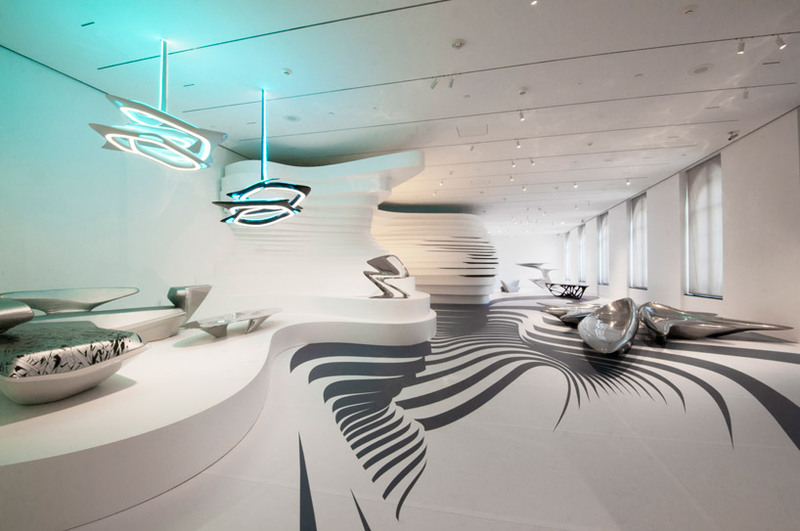 [i] “Installation Design by Zaha Hadid Creates Dynamic Setting for Exhibition of Her Recent Product Designs,” Philadelphia Museum of Art press release, August 4, 2011. [ii] Zaha Hadid Designs, “WMF Cutlery,” 2013, accessed July 26, 2014, http://zaha-hadid-design.com/collaborations/wmf-cutlery. [iii] Craig Kellogg, “CURRENTS: CUTLERY; Eat Mindlessly? Not a Chance with Zaha Hadid’s Utentils,” New York Times (New York, NY), May 24, 2007, accessed September 26, 2014, www.nytimes.com.